There are several aspects of a wedding which the bride and groom will have put a lot of effort into to find exactly what they want. From the wedding dress to the venue and from the table decorations to the wedding confetti, a lot of planning goes into the selection process! The Lincoln Town Car is a classic from many movies. When you picture a limo, this is what you will see. It’s classy on the outside, has a lot of character and taste and is will fit well for a wedding. You need a memorable journey and if you want to rekindle those memories from classic films such as Pretty Woman, this is the limo for you. Of course, the beauty is not just from the inside as within the limo, you will find neon lights which change to you what you want, plush luxury seating and a very good sound system. It can seat up to 8 passengers so there’s plenty of room to stretch out whilst holding a glass of champagne. Often referred to as the baby Bentley, this little beauty brings a slightly more modern touch than the black Lincoln Town Car. With its fierce front grill, its brings a dominating presence on the road along with its modern body shape which will no doubt turn heads. Inside you will find a very nice soft leather interior, your own private mini bar and of course lighting to suit your mood. Once again, this holds up to 8 passengers so even more room for you both! Now it’s really time to make an impact. 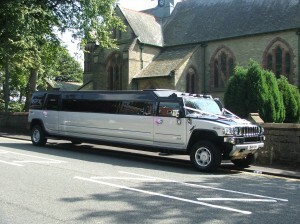 This is the ultimate Hummerzine limo hire which has the capacity to take a staggering 18 passengers! Of course that’s up to you how many people you want to take (if any!) but be assured, there is plenty of room. Inside, there are multiple LCD screens, strobe lighting, outside neon, extra headroom (*takes breath), luxury seating, disco lighting and laser lights! Seriously, what else do you need? Champagne glasses? No problem – there are plenty within the inside and plenty of space for your bottles. Need to add some balloons? Limo-Scene will do this for you! I hope these suggestions for Limos for your wedding are useful. They will all make an impact, but it just depends on how much of an impact you want to make! Thanks to Confetti Heaven for this guest article.